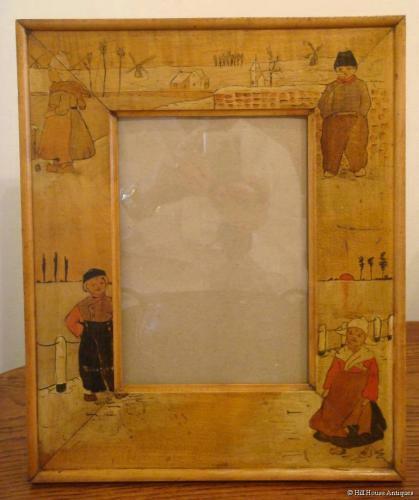 An absolutely charming early 20thC Arts & Crafts wooden (almost certainly satinwood) lacquered picture frame with typical polychrome penwork scenes of Dutch children in a Dutch landscape setting. When we acquired this frame it held a pretty non-descript painting and it can still be wall hung and used to house a painting of your choice. However,we have now also sympathetically adapted by making a removable easel backing board for it and glass cut to front, to be able to house and display your favourite photo or suchlike. Either way, can be easily used in two ways; for hanging or easel backed display.